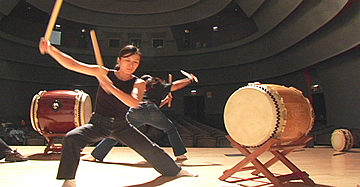 Soh Daiko, New York, 2004. The Frank H. Watase Media Arts Center of the National Museum has produced a new documentary DVD under the same name as the exhibition, Big Drum: Taiko in the United States. Featuring America's pioneering taiko figures, this DVD documents the development of American taiko and includes interviews and footage of drum-making and performances that reflect the ongoing transformation and diversification of this exciting performing art. 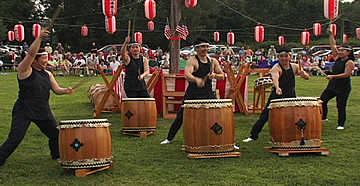 Nen Daiko (of Fairfax Station, Virginia), performing at the Seabrook Buddhist Temple Obon, New Jersey, 2004. To view a video clip included in the DVD, visit our Multimedia page. The DVD is now available for sale through the Museum Store Online. The DVD retails for $19.95.